DIY - Trashin' Fashion Show fundraiser! Los Angeles, CA: Models strode to and fro, blotting their makeup and adjusting their hair. Designers made last-minute tweaks to hemlines and shoulder straps. A producer looked anxiously at her watch. The scene backstage at the first Muir Middle School fashion show had all the characteristics of a luxury event in New York City. What’s more, it was produced by students to benefit their respective classes, all with an eco-friendly frame of mind. The Trashin’ Fashion show fundraiser featured designs made almost entirely out of recycled materials, including cardboard boxes, bottles and gardening supplies. There was a skirt made from dozens of plastic lids from disposable coffee cups, strung together like chain mail. A sleeveless top, upon closer inspection, turned out to be bubble wrap spray-painted black. Proceeds from ticket sales for the show were divvied up between the sixth-, seventh- and eighth-grade classes and will be used to help pay for their respective promotion parties. The show was conceived as a replacement for more run-of-the-mill fundraising efforts that fell flat in recent years, said Lali Cola, student government advisor. More than 40 students participated as designers, models and producers. Some worked in teams, or with their entire homeroom class, while others tapped their parents’ sewing skills. Friends Mary Mansour, Stella Aghakian and Mona Bitar created an entire outfit – including earrings and shoes – out of Capri Sun juice packets. “I am probably going to try not to fall, and show my heels because I like them,” 13-year-old Mona said minutes before she was to strut on stage in the dress. 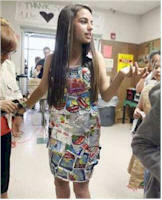 Samantha Keefer, 11, sported a dress made out of a bag made for yard waste and a belt cut out of a cat litter box. In her hand was a purse moonlighting as a box of Girl Scout Thin Mint cookies. “It is usable,” she said, cracking open a lid that had been cut into the cardboard. Staff members from the Fashion Institute of Design and Merchandising in Los Angeles were on hand to award prizes to the top designs.